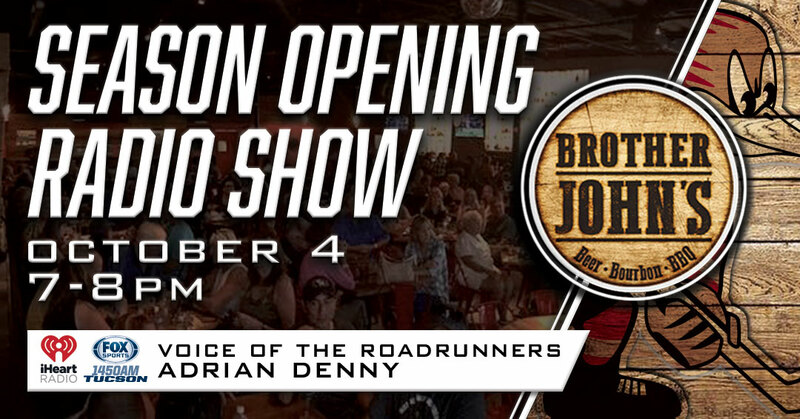 TUCSON, AZ – The Tucson Roadrunners, proud American Hockey League affiliate of the Arizona Coyotes, will begin their Fox Sports 1450 AM live regular season radio coverage on Thursday, October 4 at Brother John’s Beer, Bourbon & BBQ at 7 p.m. Fans are invited to watch the Arizona Coyotes season opener at 1801 N. Stone Ave when they take on the Dallas Stars at American Airlines Arena in Texas and stick around for 7 p.m. when the “Voice of the Roadrunners” Adrian Denny starts his one-hour season opening radio show with special guests Head Coach Jay Varady, forward Daniel Maggio and defenseman Cam Dineen. Jay Varady, 41, enters his first season as the head coach of the Tucson Roadrunners following 18 years of coaching experience in North America and Europe. Through seven seasons as a head coach, Varady holds a combined record of 209-121-31 with six playoff appearances. Daniel Maggio enters his second season in Tucson after joining the club for 13 games in 2017-18. The 6-foot-2, 190 lbs. forward has played for the Bridgeport Sound Tigers, Lake Erie Monsters, San Antonio Rampage and Toronto Marlies previously and was selected in the sixth round (#170 overall) in the 2009 NHL Draft by the New York Rangers. Maggio will wear #47 for the Roadrunners this season. Cam Dineen, the youngest member of the Tucson roster, begins his first professional season of hockey after registering 64 points in 65 games last year in the Ontario Hockey League. The 68th overall selection in the 2016 NHL Draft by the Coyotes is just 20-years-old and hails from Toms River, NJ. To purchase your tickets for Saturday’s game, click HERE.